America’s Cup contender Emirates Team New Zealand has launched its America’s Cup Class racing catamaran New Zealand, which features an innovative cycling grinding system. The design allows the team’s grinders to use their leg muscles to power the hydraulic systems on board this 15 metre foiling raceboat. All of the boat’s components were built in New Zealand, working in collaboration with local partners Southern Spars, Cookson Boats and C Tech. 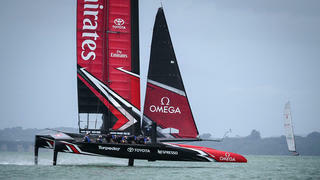 Powered by a 25 metre tall rigid wingsail, the Emirates Team New Zealand raceboat has an estimated top speed of more than 46 knots. 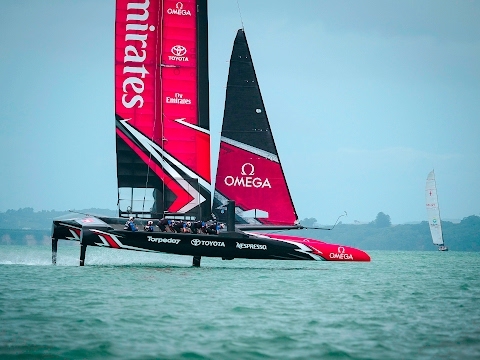 Emirates Team New Zealand has a strong history of America’s Cup sailing innovation — the team pioneered the first foiling raceboat in 2011, but narrowly missed out at the 34th America’s Cup, losing 9-8 to Oracle Team USA.